Molds are part of the natural environment. Outdoors, molds play a part in nature by breaking dead organic matter such as fallen leaves and dead trees, but indoors, mold growth should be avoided. 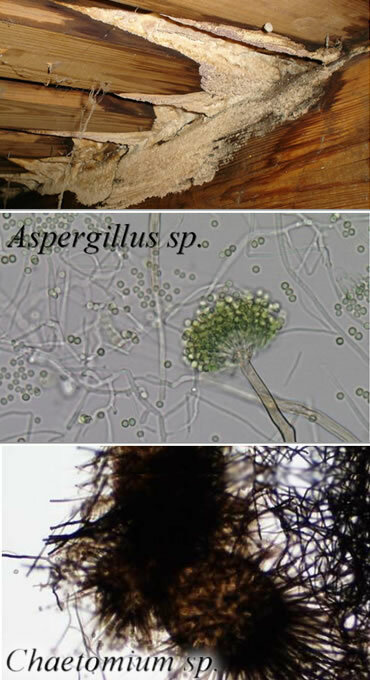 Molds reproduce by means of tiny spores; the spores are invisible to the naked eye and float through outdoor and indoor air. Mold may begin growing indoors when mold spores land on surfaces that are wet. There are many types of mold, and none of them will grow without water or moisture. Molds are usually not a problem indoors, unless mold spores land on a wet or damp spot and begin growing. Molds have the potential to cause health problems. Molds produce allergens, irritants, and in some cases, potentially toxic substance. Inhaling or touching mold or mold spores may cause allergic reactions in sensitive individuals. Allergic responses include hay fever-type symptoms, such as sneezing, runny nose, red eyes, and skin rash (dermatitis). Allergic reactions to mold are common. Mold exposure can irritate the eyes, skin, nose, throat, and lungs of both mold-allergic and non-allergic people. How Do I Know if Mold is Present in My Home? Step 1: Inspection - Using the standards set forth by The International Association of Mold Management, a thorough examination is made with attention to all conditions conducive to mold growth. Step 2: Analyzation - Upon completion of the inspection, those "red flag" areas are revisited in order that both air and surface samples can be taken. These samples are then sent for laboratory analysis. Step 3: Interpretation - Within 72 hours you will receive a detailed laboratory report providing you with everything you need to know in order to help answer the question, "Is there a mold problem here?" If you have questions or concerns about the possibility of mold in your home, call today. At Affordable Home Inspections , we're in the business of protecting the American dream.